Watermarking among the photo community can often times be a dirty word. Assumptions are made about a watermarked photo... "That photographer must be so full of himself if he thinks he's so important that he needs to plaster his photo with distracting text, so that nobody can steal his precious masterpiece." Yeah, maybe that's the case for some people, but I want to shine a different light on watermarks and explain why I use them in certain situations and why they aren't necesarilly the evil little logos they are made out to be by so many. I for one, do use watermarks on a site by site basis. On photo sharing sites I use a small watermark that usually says something like "natezeman.com©date" On the larger social networking sites like Facebook and now Google+ I add a second more obtrusive mark on the center. On my personal website I don't use any type of watermark whatsoever. It's sort of a natural progression from what some would say are overly watermarked photos, to not marked at all, and that's exactly how I want it. I'm writing this from a business point of view and in todays world social networks are one of the biggest tools we have to reach our customers. I want all of the networks I use... Facebook, G+, Twitter, 500px, flickr, ect... to funnel people to my website, which is where I do business. Now, a lot of people find watermarks obnoxious and distracting and aren't afraid to share that opinion with me. I understand where they are coming from, but I'd like you all to take a look at watermarks from a different perspective. The number one reason people use watermarks is because of rampant image theft on the internet. Do I use watermarks because of this? Yes, but not because I'm paranoid about someone stealing my 700px wide 72ppi low res photo. I believe that when you post an image online you are doing so with the knowledge that people WILL steal it and use it for whatever they want, the internet is still the wild west in a lot of respects. I don't watermark my photos because I think it will prevent image theft (believe me it won't) I've definitely had to deal with some frustrating times when I've found my images on a website being used for their profit with no credit to me. That isn't ok with me, but thats a whole other topic which I won't cover here. What I'm talking about is those who unknowingly (or knowingly) take a photo to post it to a blog, an email forward, their own website ect... I see so many photographers out there get up in arms about this... I just see free advertising. A few years back I started to get emails forwarded to me. The kind you get from your aunt that read "you have to see these cute baby animal photos" or something of that nature. Inside these emails i'd often find my own images. What struck me right away wasn't that someone had taken my photo and used it in this email. It struck me that my photo was being sent out to all these people and no one had any way of knowing how to get a copy for themselves, should they want to. After that I started using small watermarks in the least conspicuous way. This really had no effect on anything as I realized people were just cloning out my watermark in a matter of seconds and going about using it in the same way they were before. This led me to adopt a more noticeable watermark that covered the actual subject of the photo. Yes, it's a bit distracting and not ideal for viewing, but adding that extra watermark seemed to deter anyone from bothering to put the time into cloning the whole thing out. It also didn't seem to have any effect on the number of sites that were sharing my work. I'm still seeing my photos all over the place with the watermark on it. As I said before, I go on a site by site basis when it comes to watermarks, and the reason is simple. When you get down to it, random people from the massive networks like Facebook are much more likely to take a photo and put it online than are photographers on a smaller photo sharing site. So yeah, someone could go to my website and take a watermark free photo, but the way I have my "funnel" set up, by the time someone reaches my site by way of social networks they are most likely customers or other photographers who are least likely to take a photo for their blog. I'm sure people still take images direct from my site, but i'm not willing to sacrifice the viewing on my website for the sake of a few stolen photos. Afterall, I consider social networks a place to share my work, and I consider my website the place to showcase my work. 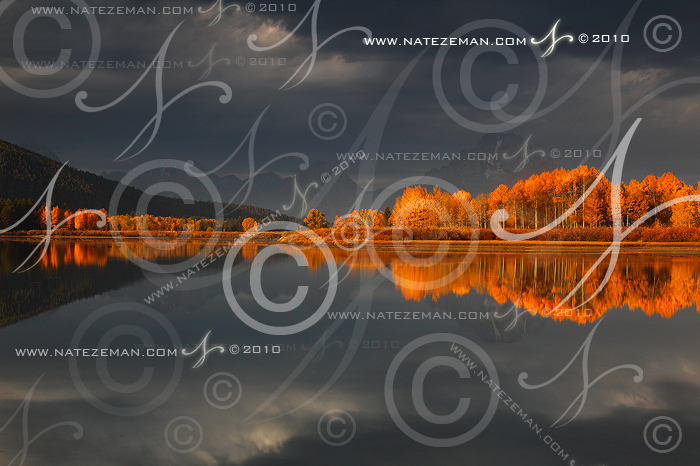 My earlier watermarks usually were formatted "nate.zeman.date. ", and my newer marks say "www.natezeman.com©date" Two of my most popular keywords that come up on Google Analytics are those two exact phrases. So, I know for sure that people are visiting my site because of the watermarks. Hits to my website are almost an exact 50/50 split between direct links from other networks and organic google searches, and I think that's a good balance to have. Knowing how many people have used those watermark keywords to get to my site lets me see how important they are to getting some of those organic hits. The most interesting part of the whole watermarking debate is that I've found, to an almost exact certainty, that it's only photographers who don't like, or even notice watermarks. That makes sense, after all, we look at photographs with a much more discerning eye then the general public. This thought of mine has been proven without a doubt over the last couple of weeks. About 2 weeks ago I joined Google+. I'm not exactly sure what's in store for the future for that site, but right now it's become a vortex that seems to have sucked every photographer from around the globe, myself included. Almost every person in my "circles" or who have added me to their circles are fellow photographers. This differs drastically to my Facebook fan page which is made up mostly of "fans" who are not photographers themselves. In the two short weeks since I've been tinkering around on G+ almost every single photo I've posted has multiple comments complaining about the watermarks, and how they wish I wouldn't use them. This is in stark contrast to my Facebook page. I've had my facebook page much longer and I've literally never had one comment about my watermarks. Keep in mind that these are the exact same files I upload to G+. So, while I wish I could post watermark free images for all my photographer friends to enjoy, it's just not worth it to me. For my business model (which is aimed at selling limited edition prints to collectors) my watermarks help me. I'm not in the business of impressing other photographers. There are plenty of photographers out there who market themselves to other photographers to sell tangible and intangible items like "how to" books and photo workshops. For those people none of what I'm saying would probably apply, but for me it does. Now, this is probably more than you would ever care to read about on the subject of watermarks, but It's become such a prevalent issue for me lately that I thought I might shed a different light on them. I know a lot of you will discount this and be anti-watermark forever, but it's something I do utilize and will continue to utilize as long as it's helping my business, and maybe it's something you should be doing too. If nothing else, I can at least use this article as a link to point all of my "why do you use that obnoxious watermark" comments to, at least you can't accuse me of not having an answer!